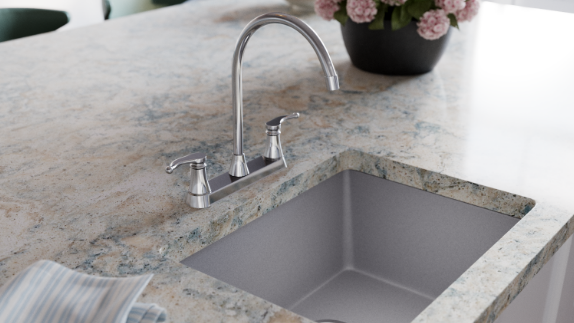 The most visible imperfections on your kitchen faucet are generally the easiest to remove thanks to their surface-level nature. In fact, many unsightly spots and smudges can be eliminated by simply wiping the kitchen faucet with a wet rag and patting it dry. If a stain is more serious or of a harder-to-remove variety, you may need to employ the use a mild cleaner. 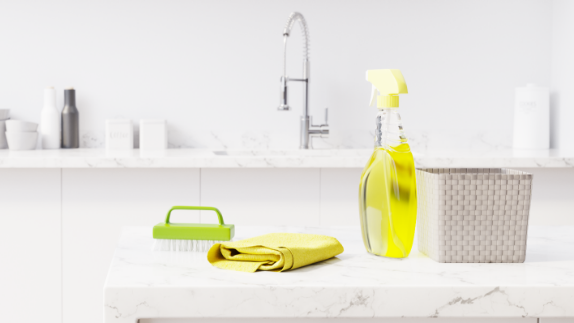 Unless your sink is made of iron, you can use vinegar or basically any all-purpose cleaner. Just apply the cleaner to a clean rag and wipe down the surface of the kitchen faucet to leave it sparkling. 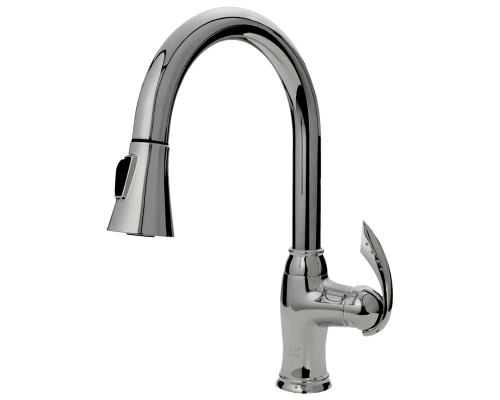 A dirty kitchen faucet head can cause uneven or obstructed water flow, decreasing pressure or causing unpredictable dispersion. This can be caused by buildup on the surface of the head or mineral deposits within it. To properly remedy the situation, you’ll have to address both potential issues. 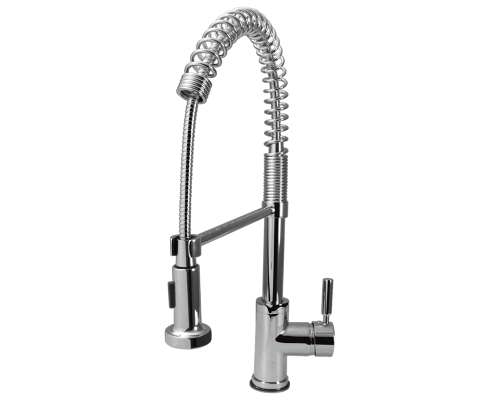 Typically, the kitchen faucet will have an aerator on the head—you’ll want to remove this by ensuring the water is off and then unscrewing it. A simple way to remove build up from the aerator is to place it fully-submerged in white vinegar. You may need to use something like an old toothbrush, a toothpick, or other similar tools to thoroughly clean the screen-like aerator. 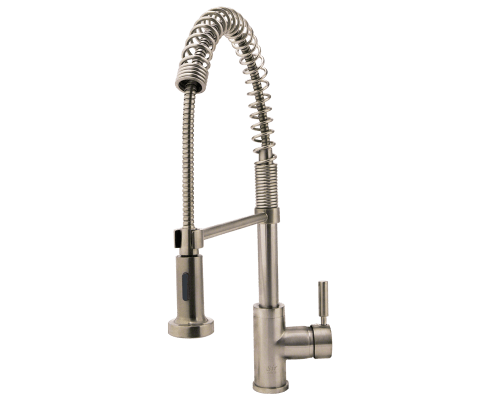 This process should remove any buildup, allowing your kitchen faucet to perform properly again! 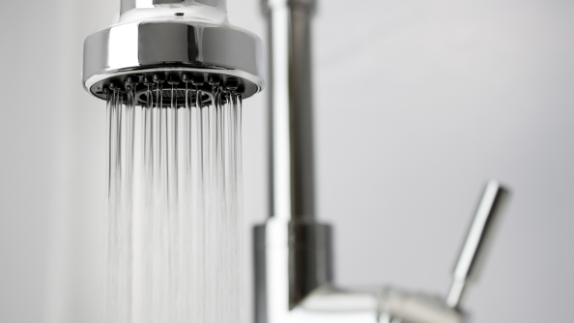 SOAP SCUM Regular wear-and-tear is bound to take its toll on your kitchen water faucet. Additionally, the composition of your water may lead to buildup from various minerals. To effectively remove these tougher stains—those that remain after you have tried cleaning with water and mild cleaner—you will need to assess what type of stain you are dealing with. For stubborn soap scum, mix white vinegar and baking soda, then allow the mixture to sit before rinsing it off with water. If your kitchen faucet has green deposits, you’ll need to use equal parts ammonia and water. Apply the mixture with a clean rag (wear gloves! ), then make sure you rinse away any residual ammonia and allow your faucet to run for a minute, clearing an excess ammonia from the pipes. 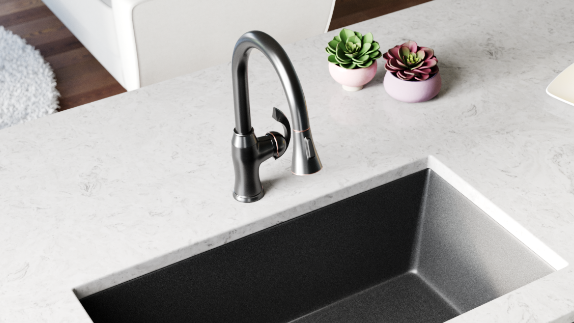 DARK STAINS OR RUST To clean red or brown stains (typically rust) from your kitchen faucet, you’ll want to use the natural acidity of lemon juice in conjunction with borax. This paste-like substance can be applied to the faucet, then wiped away with a clean rag. Darker stains—typically brown or even black—may require a mixture of cream of tartar and hydrogen peroxide to completely remove. 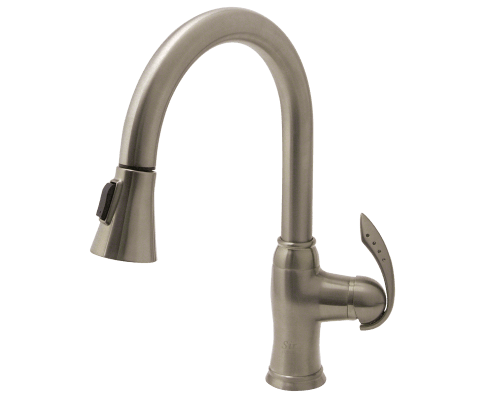 Again, simply use a clean rag to wipe away any excess and leave your kitchen faucet as pristine as the day you bought it.